The Mikado. 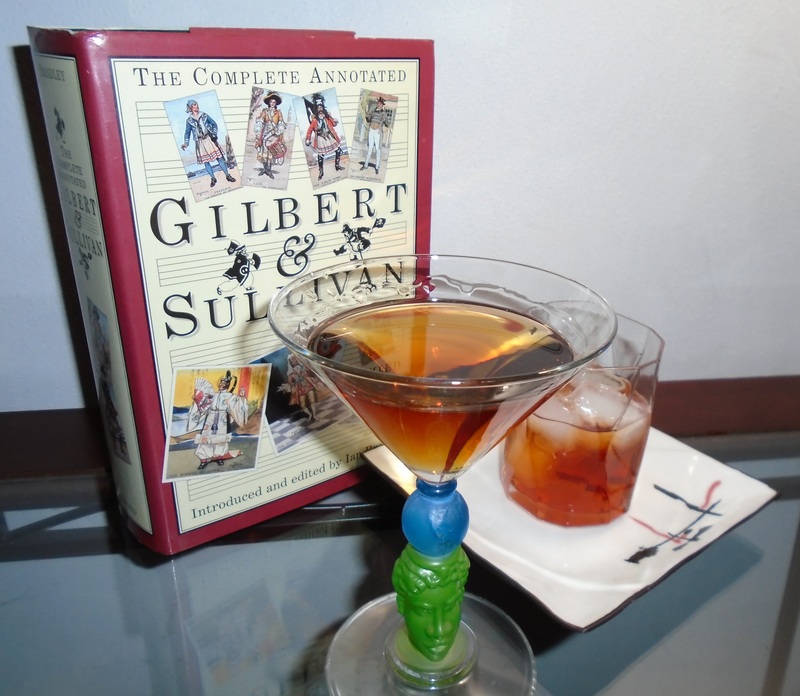 Is it a comic opera by Gilbert and Sullivan, an archaic term for the emperor of Japan, a brandy-based cocktail, or a hamlet in Saskatchewan? How about all of the above. But from whence does this Friday Cocktail come? It appears in the 1964 edition of Old Mr. Boston De Luxe Official Bartender’s Guide, but its origins or the why behind its name appear unknown. Wikipedia doesn’t even have an entry for it as a drink! And yet there are two distinct recipes for this cocktail. Presumably they both strive to achieve a yellow color, which Mikado is also a term for. Though I can’t imagine how this is done. Neither recipe is likely to yield up any shade lighter than amber. I like to think the drink was inspired by the Gilbert and Sullivan opera, but it’s unlikely that it dates as far back as 1885, when The Mikado first debuted. Perhaps it was the result of a subsequent viewing. The production is one of the most frequently produced of the Savoy operas written by G. and S., though I’m partial to The Pirates of Penzance. Pour 2 ounces of brandy, 1/2 each of crème de Cacao and crème de Curaçao in a shaker over cracked ice. Add in a couple dashes of bitters. Shake vigorously, and then strain into a cocktail glass. The alternate recipe calls for 1 ounce of brandy and a dash each of Grenadine, Triple Sec, Crème de Noyaux, and Bitters to be served in an old-fashioned glass over ice. These proportions, however, are way too tiny, and I would suggest 2 ounces of brandy and a splash of all the remaining ingredients, except bitters. Just a dash or two of bitters will suffice. How I like it: Quite rightly you might wonder which of the two pictured drinks is favored. Now, there are two substitutions in play here. One… I have never seen a bottle of Curaçao that isn’t blue, and I don’t think that color is meant for this drink. Instead I used Grand Marnier (although you could also use Triple Sec or Cointreau). Second, Crème de Noyaux, though still produced, is not easy to come by. It’s similar to Amaretto, and that’s what I used here. So which one did I like? The second and alternate recipe is sweeter and pleasantly chilled on the rocks. Though not quite as sweet, the “original” recipe is a tad more sophisticated and better served up at room temperature. Ultimately, they are very different flavors and both are lovely to try and to decide for yourself. I will, however, note that I made use of an apricot-flavored brandy which lends itself to this cocktail very nicely. Don’t let them be fickle and drink responsibly!